"Gotta Dent? Get MAD! Get Mend A Dent!" 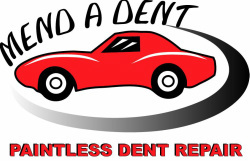 ﻿P﻿aintless Dent Repair (PDR) ﻿﻿﻿﻿is rapidly revolutionizing the world of ding and dent repair. The PDR process is the art of removing minor dings, dents, and creases from a vehicle, while maintaining the integrity of the factory or custom paint finish. It uses specially designed tools that work from behind a vehicle's metal panels to manipulate and flex the panel back to its original form — without damaging the vehicle's factory finish. This unique process takes only a few minutes, so dent repairs are performed easily and conveniently. It provides virtually undetectable repairs to the non-collision minor damages vehicles experience daily, and at approximately one-fourth of the cost of traditional body repair shops. If your damage consists of ﻿dents that are shallow dings, smooth dents, a﻿nd creases ranging in diameter from dime size to softball size, even to basketball size, with no paint damage, then the PDR process would be the ideal solution. If the damage is too severe or paint damage is involved, such as sharp dings, dents, and creases that have been stretched too deep, areas reinforced with double metal such as the edges of a vehicle’s doors, hood, and trunk, damage on the edge of a body panel, or dents with ﻿extensive paint damage (cracked or broken paint), the PDR process is no longer a viable option. ﻿Then a traditional body shop is what you need.